The full expression of a given terroir requires human intervention, which mingles knowledge of the soils and the different local climates with generations of experience, based on patient observation and respect for the vines. It goes without saying the vines of our various terroirs are harvested manually and are free of fertilizer. Every other inter-row benefits from natural grass growth, plowed several times a year with different tools to develop the soil’s organic life. The summer ploughs uproot the long grass that invades the row and competes with the vines. This leaves the vines to develop on plots with a remarkable south-facing exposure to the sun’s rays. The elders knew that a good hoeing is worth two waterings, especially since these can be quite rare on the slopes in the summer! Soil amendments, traditional protective treatments such as the so-called “bouillie bordelaise” (a copper-based fungicide) and sulfur in small doses make up the basis for action against predatory fauna and fungus. The vines flourish on hilly slopes where she can better defend herself by her own means as long as the environment is favorable. 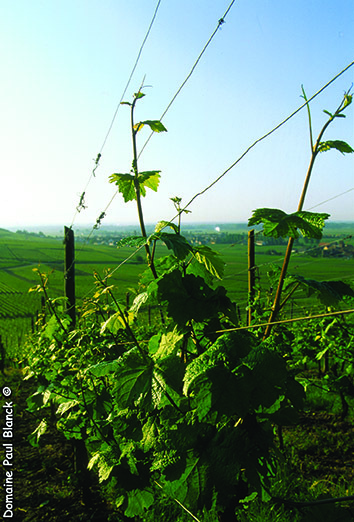 Despite the fact that in the heart of summer all vegetation suffers, the flora is a precious auxiliary for the vine grower eager to create a rich and protective biodiversity. Leaving technical explanations aside, this dimension is essential to create a strong synergy of the living without which it would be impossible to imagine terroir crus and how they titillate and stimulate the human mind and spirit. A vine is a habitat for insects, plants, a fauna and a flora often microscopic, it is the still little-known action of the vine’s roots whose underground presence creates a vital and natural movement full of poetry. The vine plays the role of a conductor or maker, creating order in this terrestrial cosmos. Each terroir is unique. Man has always sought a link to his Land. The Cru is the most useful, the most pleasant and the most constant of the relations between Man and his natural environment. It is the local environment’s answer to the effort of Man to manage the natural habitat and turn it into a supportive eco-system, basing his action on observation, ingenuity and hard work. This symbiosis fosters stability and the right conditions for the production of grapes that will go on to produce living, vibrating wines.